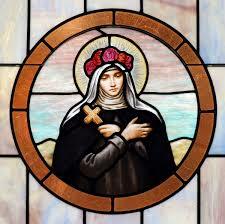 O God, you set Saint Rose of Lima on fire with your love, so that, secluded from the world in the austerity of a life of penance, she might give herself to you alone; grant, we pray, that through her intercession, we may tread the paths of life on earth and drink at the stream of your delights in heaven. Through our Lord Jesus Christ, your Son, who lives and reigns with you in the unity of the Holy Spirit, one God, for ever and ever. Amen.